October 2009 – Geneva – ALPINA, Swiss manufacturer of high quality sports watches based in Planles-Ouates, Geneva, is honored to present one of its most discrete creations so far: the impressive Extreme Chrono Double Digit. This new automatic chronograph features a discrete yet outstanding design and a perfectly balanced dial with a bi-compax configuration. The specific and technical design of this new Extreme Chrono Double Digit capitalizes on the strong brand philosophy of ALPINA: highest level of accuracy, extremely high readability, shock resistance, sturdiness and reliability. The timepiece, with a bold but comfortable case diameter of 46 mm, is featured in two different case versions: one in stainless steel, and one “Full Black” made out of black PVD steel, both surrounded by a PVD black coated bezel and connected by six ALPINA screws. Two options for the dial finishing, one with red counters for a perfect readability, and a second one with a full mat black dial for the perfect styling. 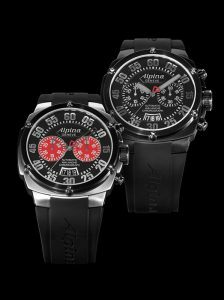 It features clear, finely brushed steel ALPINA Double Digit-indexes. The iconic ‘Extreme’ design elements remain – along with an even bolder and more elaborate dial design. The chrono counters, perfectly balanced in the center of the dial, surround a clear-cut, centralized date indicator. The automatic chronograph caliber AL-850 features a black PVD signature ALPINA oscillating weight, which is visible through the exhibition case back. Both front and reverse sides are equipped with sapphire crystals. Automatic, Calibre AL-850: self winding, 28’800 vibrations per hour, 37 jewels. Alpina Black PVD plated rotor. functions: seconds counter, 30 minutes counter. Black PVD case with black PVD bezel and case back, 46 mm diameter, 3-part case secured by six triangular-shaped stainless steel screws, sapphire crystal, see-through case back, 10 ATM Water-resistant, ABScoated screw-down crown with red Alpina triangle pattern. 2 Pushbuttons for the chronograph functions. Matte Black dial, with red counters. Silver applied indexes in steel. Skeleton in fine brushed steel. Black Rubber strap with deployment buckle in option.